LEE'S SUMMIT – This Thursday night, the Kansas City Chiefs are hosting the Oakland Raiders for a nationally televised game and KC Scout is already preparing for increased traffic around the stadiums. Regular traffic volume on I-70 peaks at more than 116,000 cars where I-435 meets I-70, which is also one of the key corridors for stadium traffic. KC Scout boards along I-35 impacting traffic headed down town, I-435 coming into the I-70 interchange, along I-70 and I-49 into Route 71 will warn drivers of heavy traffic around the stadium. That messaging will begin during rush hour tonight and encourage drivers not attending the game to find an alternate route home for Thursday. Gates open for tailgating at noon with kick off at 7:25 p.m.
KC Scout offer camera views of traffic through the metro, including 8 cameras along I-70 and I-435 around the stadium, so motorists can check out their commute before they leave. Review those cameras on www.kcscout.net. 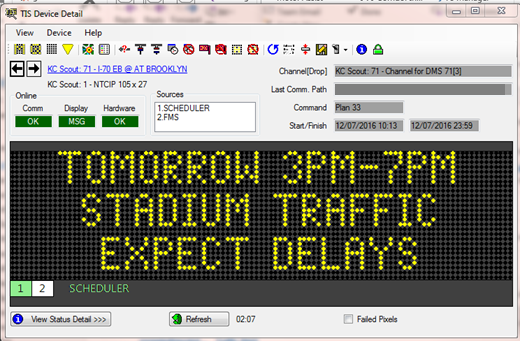 If you plan to attend the game, the Chiefs are offering a coach's note to leave work a little early and beat the traffic.